Contest closed. 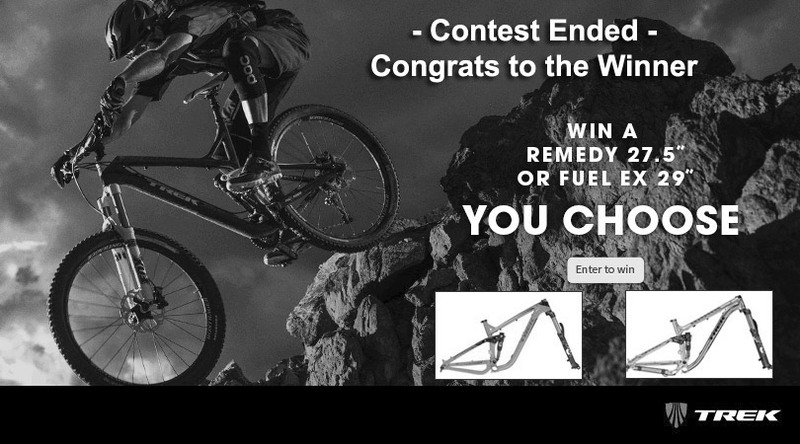 Congrats to: Ricky Krebs from Hemet, CA! Sure could use a new rig! Mtbr rules! Please make my summer awesome with a new bike! I can’t think of a better birthday present!! Trek remedy 9 650b for me. I have a ’99 Trek VRX 200 that I bought new. I still ride it three times a week. It is ready to retire though. Hook me up with a sick ride! Shoutout to Cape Fear SORBA!! 650b in a medium sized or 17.please. Trek is the ultimate frame choice in today’s competitive market. Guys. Trek is amazing. Send this Great 650B to Holland. Love. I want a remedy to rip the trail. Can yoy make may wish come true. Thanks for the chance to upgrade! KOOL Need one of these frames! Remedy 27.5 for me please. Gotta stay true to the 29er! Definitely the FUEL EX 29er all the way! I want one of these before I get too old to ride! I hope to win a Remedy, since I already own a cool Fuel EX. YOU GUYS ARE AMAZING, YOUR BIKES AND PRODUCTS ARE SECOND TOO NONE…I’VE ALWAYS OWNED A TREK AND THATS THE ONLY BRAND I’D BUY.. THANK YOU FOR YOUR TIME AND CONSIDERATION …. My wife needs a 27.5 bike, the timing would be sweet.. I would wring either bike’s neck!! Either (or both :D) is good; free.99 is the best! THIS SOUNDS AWESOME. I WISH I COULD WIN.